By many accounts the beings of Fairy are divided into two courts, the Seelie and Unseelie. This is often simplified as the 'good' and 'bad' fairies, or as F. Marian McNeill says the 'gude wichts'* and the 'wicked wichts' and was initially a Lowland Scottish belief that later spread (McNeill, 1956). I think we lose the nuances between the two when we try to reduce them into such blunt terms as good and bad (or worse good and evil) and also that many modern people may not fully understand the concepts of seelie and unseelie. So let's look at what exactly seelie and unseelie mean, and how the two courts were traditionally understood, as well as the likely original roots of both as a single entity. The words seelie and unseelie come to us from Scots, itself an amalgam of a variety of languages found in the Lowland areas of Scotland. Although its most often seen today as 'Seelie' it also appears in older texts in a variety of forms including seely, seily, sealy, with seely being the most common (DSL, 2016). It is often a term in Scots dictionaries associated with the fairies and given as an adjective to describe both a fairy court and the disposition of individual fairies themselves. Meanings for seelie are given ranging from happy, blessed, lucky, fortunate, and good natured, as well as having connotations of bringing good luck (DSL, 2016; Jamieson, 1808). In contrast unseelie - also spelled oonseely, onseely, unsealy, or unseely - means dangerous, unlucky, unfavorable, unhappy, unholy, and ungodly (DSL, 2016). The word unseelie, in the form of unsely, can be found as far back as the 16th century meaning unlucky or miserable but has generally been applied to times, places, and animals (DSL, 2016). I have been unable to find any older references to unseelie being applied to fairies. The Seelie court is described in relation to the fairies specifically as the "pleasant or happy court, or court of the pleasant and happy people" and is also given as a general term for all fairies (Jamieson, 1808). In folklore the Seelie court can act benevolently at times for no reason other the sake of kindness, as we see in the 1783 ballad of Allison Gross, where the eponymous witch of the story punishes a man who refused her sexual advances by bespelling him into the shape of a worm. The unfortunate man is cursed to circle around a tree every day in this form, until one Halloween "when the seely court was riding by" and the queen stops, picks up the worm, and uses her magic to restore his original shape to him (Child, 1882). They are also know to be extremely generous to those whom they favor and to be kind to the poor, giving bread and grain as gifts (Briggs, 1976). It was believed that members of the Seelie court would help those who propitiated them and that this help took various forms including the fairy doing work for the human around their home or farm (McNeill, 1956). Despite its reputation as generally kindly the Seelie court was known to readily revenge any wrongs or slights against themselves, and even a fairy who would be considered Seelie, such as a Brownie, could be dangerous when offended or harmed. The Seelie court is not known to harm people without reason though and generally will warn people at least once before retaliating against offenses (Briggs, 1976). The Seelie court can also act in ways that go against what we would consider goodness, or at least in ways that bring harm to humans, without a clear reason. We see this in the Ballad of Lady Mary O' Craignethan where the Lord's daughter is quite deviously kidnapped by a man of the sidhe to be his bride; the Lord then curses the fairy folk, wishing that the Devil may take three of them instead of one as his tithe, and swearing to cut down every oak, beech, and ash in the country to which the priest begs him "dinnae curse the Seelie Court" (Sand, Brymer, Murray, & Cochran, 1819). This illustrates that it was in fact the Seelie court that was believed to be behind the kidnapping, although as we shall see later the term Seelie court itself may have served as a euphemism for all fairies, rather than a specific term only for the benevolent ones. The Unseelie court is for all intents and purposes the antithesis of the Seelie court, as implied by the name. The Unseelie court is described as always unfavorable to humans and is closely linked to the Sluagh sidhe, the malicious Host who torment people and cause illness and death where they visit (Briggs, 1976). The Sluagh itself is strongly tied to the dead and is known to kidnap hapless mortals and force them to help with the Host's entertainment, usually harming other humans, before dropping them in a location far from where they were grabbed. The Unseelie court is comprised of many solitary fairies of a malicious nature, those who feed on or enjoy hurting mortals for sport, although not all Unseelie fairies are solitary (Briggs, 1976). The Unseelie court was seen as constantly ready to cause harm or injury to mortals and were avoided as much as possible, and many different protections existed against them (McNeill, 1956; Briggs, 1976). However just as the Seelie court could cause harm if motivated to, and sometimes without having any clear reason at all, so too the Unseelie court's denizens may occasionally act kindly towards humans without any obvious rhyme or reason. For example Kelpies are usually considered Unseelie by most reckonings, as they trick people into riding them only to kill and eat the person once they have gotten back to their watery homes, however in several stories a Kelpie will fall in love with a mortal girl and put aside his own bloodthirsty nature for her sake. In one such story the Kelpie even put up with being tricked by the girl, captured himself and forced to work in his horse form on her father's farm for a year, and still loved her enough in the end to choose to marry her (McNeill, 2001). So while it may be convenient and often expedient to divide the Other Crowd up into the two courts based on how they relate to us, we should be very cautious about seeing the division as a hard line or seeing a perceived placement in one court or another as a non-negotiable indicator of behavior. As scho sayis, with sur sillie wychtis"
This reference uses the term Seelie as a generic for fairy with no obvious distinction as to benevolence or malevolence, as do the other ballad references, supporting the idea that at some point there was likely only the concept of the single Seelie Court, used as a euphemism for all fairies. Much like the Welsh calling their fairies Tylwyth Teg [Fair Family] or the Irish use of the term Daoine Maithe [Good People] the Scottish Seelie Court [Blessed court or Happy court] may initially have been a way to speak of the fairies so that should their attention be drawn they would be more likely to be well disposed towards the speaker. This concept, at some later point was divided into seelie and unseelie to better define those beings who either meant humans well, generally, or meant humans harm, generally. While it may seem strange to us now, it is entirely logical that in the past people would have used the euphemistic Seelie Court when referring to the fairies, but not had an inverse negative concept as it would have been seen as impossibly dangerous to even speak of such a group and risk drawing their attention and facing their wrath for it. This could also explain why the idea of the courts as such is unique to Lowland Scots lore and more generally Scottish folklore. It is not found in Welsh or Irish fairylore** where euphemisms like 'Mother's Blessing' and 'People of Peace' are still used by preference. 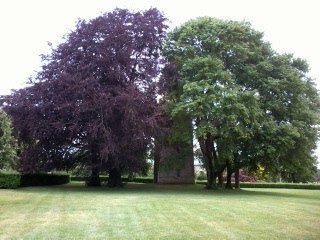 **although I believe in recent decades the idea of the two courts has spread to Ireland, it isn't found in older material to my knowledge and I was unable to find a single reference to the two courts in any of my Irish folklore books. The Irish system is based on a multitude of sidhe (fairy hills) ruled by different kings and queens, with each being its own kingdom in a way. All the Irish Fair Folk, it seems, are ambivalent in nature and cannot easily be placed into a grouping of 'good' or 'wicked'. Come clear of the nets of wrong and right"
There's a running joke among my friends - or at least it started out as a joke - that I consider myself 'Chaotic Neutral'. It grew out of my adopting the gaming alignment term for my particular approach to ethics within my practice of Fairy Witchcraft (specifically, because Druidic ethics would definitely be more Lawful Good). If you're guessing at this point that I have previous experience playing rpgs you would be correct. 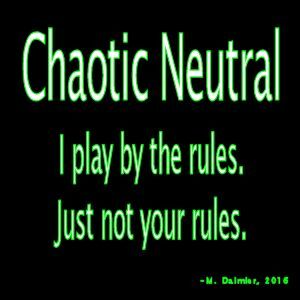 I had started to refer to myself as Chaotic Neutral because I found some aspects of the gaming alignment actually fairly descriptive of both situational ethics and fey ethics and also because I thought it was funny. Over time people began to ask me, quite seriously, what it meant and it shifted from something that was purely a jest to something more solid. Which is oddly a very Chaotic Neutral thing for it to do. 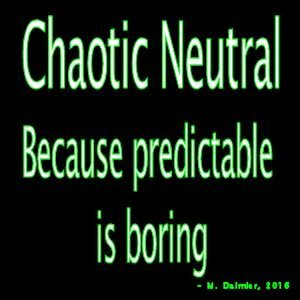 But lets back up a bit for people who don't know what Chaotic Neutral is. This is the standard gaming definition. 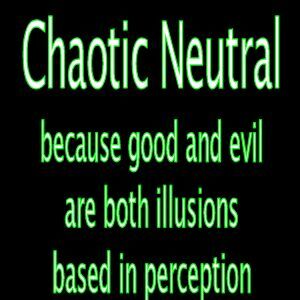 At its core Chaotic Neutral is neither good nor evil by the traditional definitions of the terms, but neutral; they do not generally seek to actively help others out of altruism nor do they seek to actively hurt for the sake of malevolence. Neutrality in this case isn't a lack of choosing sides, but a lack of commitment to either ultimate purpose, which is where the chaotic aspect comes in, because someone who is Chaotic Neutral can choose to act in either direction, to do good or to harm, if the situation seems to warrant either. There is an emphasis on balance and the need for both good and evil in the world. Chaotic Neutral emphasizes following your own whims, indulgence, and the value of the self. Independence, self-reliance, unpredictability, randomness, and freedom are key aspects of this alignment. As to Fairy ethics and Fairy Witchcraft ethics (excerpted from my book Fairycraft): "Ethics in Fairy Witchcraft, as with so many things Fairy, are tricky, and may best be described as situational ethics, where there are few hard and fast rules but rather the situation dictates the correct moral response. Generally speaking a person should strive to be kind, take responsibility for their own actions, be generous, compassionate, brave, and honest because these are qualities fairies respect. However in some cases it is also good to be clever even if that involves deception, if you can pull off being tricky in an honest way, because fairies also admire people who can outsmart their adversaries. In any dealings with the Otherworld it is essential to be completely honorable; fairies expect that a debt will be repaid and oaths will be kept. They abhor liars, however they admire cleverness and deception is an art form in Fairy where it is entirely possible using semantics to lie by telling nothing but the absolute truth. Fairies love beauty and this includes beauty of spirit; therefore they love people who are generous, kind, helpful, and compassionate. However they themselves are also beings of unmixed passions, as Yeats would say, who love or hate completely and react to anything in ways we consider extreme. Those they approve of are often rewarded with extreme generosity while those who anger them are punished in ways that seem excessive or even cruel to us. Although they do admire determination in us, it is unwise to try to imitate this behavior ourselves as the negative end of the spectrum tends to typify the things fairies themselves dislike in us. In other words trying to act like you might believe a fairy would in anger is more likely to anger them than win their approval. It can be difficult for us to understand the fairy people and the fairy Gods when their behavior seems unethical to us, because there are many aspects of their nature we will never be able to fully understand. What we can know though is what they expect of us and what behavior they want to see from us, and that is what we should strive to do. Living an honorable life and being generous and honest is important for anyone following this path." Now for me it was fairly obvious that the two concepts, fairy ethics and Chaotic Neutral alignment, overlapped. Both emphasize a degree of unpredictability and of transcending the usual understanding of 'good' and 'bad'. Chaotic Neutral and Fairy reject the idea of following human societies expectations of behavior or doing something just because its expected. A fairy bride, for example, might cry at a wedding or laugh at a funeral, and a chaotic neutral character might appear to runaway only to return and help unexpectedly. the point being that they are not bound by the rigid requirements of society at large. Both also admire trickery when its done within a specific context, usually to achieve a specific end and within very set boundaries (for example without lying). And both fairy ethics and Chaotic Neutral emphasize the value of personal fulfillment and indulgence while avoiding actions that are committed to either one extreme or another. Both also often confound people who want an easy to understand and predictable response to any situation. Sometimes a fairy will help you, sometimes they may hurt you and often people find the nuances that decide the reaction, helping or hurting, hard to predict simply because they go into the situation expecting human responses. Sometimes a character with a Chaotic Neutral alignment* will help you or hurt you, and this also often feels unpredictable, not because it is but because we tend to ignore the actual indicators of behavior and instead look for what we'd like to see from that person. In the same way the ethics of Fairy Witchcraft, because they are situation based, are not a clear-cut easy to define thing, but rather a matter of seeking to achieve the best outcome possible in the situation, and that will always be a matter of personal perspective. My personal approach to Chaotic Neutral as a real world concept is pretty straightforward. I see it as an easy and humorous way to describe my approach to life, and particularly ethics. Being chaotic Neutral, ultimately means doing what you feel you need to do, or want to do, while simultaneously understanding that you bear the full responsibility for the consequences of all your actions, positive or negative. Freedom is important in our actions, and it is on us to choose how we react in a situation; we understand that we are not bound by a system of divine reward or punishment so much as we are obligated to deal with a system of consequences for what we do, and so then it is on us to choose our actions and accept those consequences, whatever they may be. If we were to have a Chaotic Neutral Rede it would be something like: 'Do what you enjoy, if you are willing to pay the cost'. Okay in fairness it would really be more like 'Be serious when needed, otherwise shenanigans'. That's the chaos aspect of it, the balance between serious and pleasure, between fun and grim, and sometimes the two overlap and occur simultaneously; that is also very, very Fey in its own way. There are rules, and ethics, and guidelines to follow - as mentioned above - in how to be a good person, its just that e worry about our own definition of what a good person is and not what society or other people think makes a person good or bad. A key aspect of it is understanding that perspective is hugely significant in judging whether something is 'good' or 'bad' and that one person's good is almost always another person's bad. The wolf eating the rabbit is terrible for the rabbit but great for the wolf, for example, and yet ultimately this action - terrible and great - is also necessary to preserve a much wider and important balance. And that is Chaotic Neutral. *popculture examples of Chaotic Neutral characters: Captain Jack Sparrow from Pirates of the Caribbean, Q from Star Trek Next Generation, the eponymous character on House, Riddick, Ferris Bueller. For those that don't get the popculture examples - to be more straightforward: cats. Cats are Chaotic Neutral. Might cuddle with you and make you feel better. Might claw your hand and draw blood. Dealer's choice. There is a long tradition in folklore of various fairy markets, places that humans sometimes stumble across and that can be perilous or provide opportunities for trade, depending on how the human behaves. Many stories of these markets or fairs appear in collections of folklore from the last several hundred years, when writing down such stories became fashionable, and often reflect similar themes. These stories portray the ambiguous nature of the Good Folk, who may reward those with good manners or severely punish those who they feel are violating their privacy, and the markets themselves can be pleasant or dangerous (Briggs, 1976). One particularly interesting type of fairy market, mentioned in a poem written in the late 1850's, is the Goblin Market. Literary critics, especially those discussing the poem in the latter part of the 20th century, tend to ignore the piece's folklore and fairylore themes and discuss it purely as a work of Victorian literature with cultural, sexual, and feminist undertones. However the work has strong and clear ties to traditional fairy beliefs and deserves consideration on those merits as well. The poem is the story of two sisters, Laura and Lizzie. Every 'morning and evening' the girls would get water at the brook and would hear goblins calling out, selling fruit. Lizzie warns her sister not to even look at the goblins, but one time Laura can't resist peeking at them and what they are selling. Lizzie runs away, but Laura stays and the goblins, who are processing past caring trays and baskets of fruit, offer her their wares. When she explains she has no money they trade her the fruit for a lock of her golden hair and single tear. She then gorges herself on the fruit and on the juice and afterwards, not knowing if it was night or day, she stumbles home. Her sister meets her at the gate, upset and reminding her of their friend Jeanie who also bought the goblin fruit and afterwards pined to death searching in vain for another taste but unable to find the goblins again. Laura dismisses her sister's concern and says that the next night she will get more fruit to share with Lizzie, mentioning that she already wishes she had more of it to eat herself. The next day Laura is already pining for the fruit but when evening comes although her sister can still hear the goblins' call at the brook, Laura cannot. Laura then falls into decline, refusing to eat, her hair turning grey, losing the will to do her chores; remembering their dead friend Jeanie, and in desperation to save her sister Lizzie takes a silver coin and goes to find the goblins. They come to her, pleased, and she gives them the coin and asks to take the fruit, but they insist she eat with them. She refuses and says if they will not sell her the fruit to take she will take her coin back and go. The goblins become furious and attack her, clawing and hissing, trying to force the fruit into her mouth. Finally, having pinched her black and blue and covered her in fruit juice but failed to force her to eat, the goblins admit defeat and give her back her coin and leave. Lizzie flees home and tells Laura to lick the fruit juice off of her, and though she cries and the juice is like 'wormwood on her tongue' she does. Tasting the fruit a second time puts her into a fit; she tears her clothes and leaps around the room until she collapses. Lizzie tends her throughout the night and in the morning Laura awakens completely cured and restored to her previous self. The poem ends with both sisters grown and married, telling their children the story of how their sisterly love for each other saved Laura from a terrible fate and emphasizing the value of sisterhood. Looking at the story conveyed in the poem several obvious fairy themes are immediately apparent, including the importance of liminal spaces and the dangers of dealing with malicious fairies. 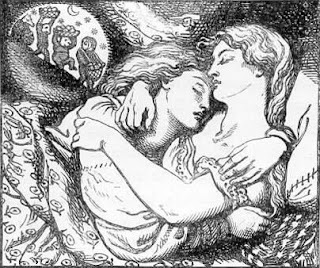 Katherine Briggs suggests three main themes for the goblin market as well: the violation of fairy privacy by looking at them, the breaking of the taboo of eating fairy food, and the rescue of a person from Fairyland (Briggs, 1976). All of these concepts can be found in various forms in other stories of fairy markets and fairs, although few are as overtly dark as the Goblin Market. Even small things in the poem, like Laura choosing to address the goblins when she speaks to them as 'Good folk' and the description of them as each deformed in some way yet alluring in their manner hint at traditional fairylore. In the poem both Jeanie and Laura are described as going gray, and this too may reflect a known effect fairies can have on people; in some anecdotes those who have interacted with fairies display premature aging as a result (Narvaez, 2001). And it is also worth noting that after dealing with the goblins each person loses track of time entirely, becoming unsure if it is even day or night, with a loss of time or time shifting yet another common occurrence when dealing with fairies (Briggs, 1967). The goblins only appear at 'morning and evening' or in other words the liminal times of dawn and dusk. These times are well known to be likely for fairy encounters and caution is often advised for those travelling at such times (Briggs, 1967). Additionally the girls only hear the goblins when they are in another liminal place, standing on the banks of the brook, at the very edge of the water filling their pitchers. In this position they are neither on land nor in the water, but between the two. We see a third reference later to another liminal place, when Laura runs home after eating the goblin fruit, Lizzie meets her at the gate, warning her sister again about the danger as she stands on the threshold between their yard and the outside world, with Laura still on the outside. Briggs suggests, and I agree, that Rossetti's goblins - with their cleverly baited trap set to lure mortals to their doom - are certainly Unseelie court and are strongly reminiscent of the darker tales of fairies to be found in traditional lore (Briggs, 1976). Dealing with such beings, intentionally or accidentally, often proves painful or fatal for the mortal involved. In the poem the reader finds out that the girl's were aware of the danger presented by the goblins, as they had lost a friend previously to the fruit. Lizzie says when talking about Jeanie's death no grass will grow on her grave and the daisies that Lizzie planted there 'never blow' making it clear that the girls knew her death was unnatural. Briggs relates the maliciousness of Rossetti's goblins to bogies, as well as the menacing fairies of Finnbhearra's court, and the malevolent revelers of Lady Wilde's tale of 'November Eve', all of whom cause human suffering (Briggs, 1976). In general it is neither uncommon nor surprising for fairies to be harmful or to seek to either trick people or to steal young women (O Súilleabháin, 1967). However to exclusively do so is the hallmark of the Unseelie Court which is said to be inimical to humanity by nature*. The first misstep by Laura is to give in to the temptation to look at the goblins as they pass by with their traveling market. Although they are the ones tempting her to look, and ultimately to taste the fruit, there are old taboos about acknowledging to others that one sees the fairies and especially about watching them when they are going about their business. Although the girls can hear the goblins they cannot see them unless they intentionally look for them, something Lizzie knows is dangerous as she immediately says 'we must not look at goblin men' and when her sister seems tempted again she says 'Laura you should not peep at goblin men'. The fairies are well-known to be secretive people who punish those who spy on them and more so those who talk about what they have seen (Briggs, 1976). This perhaps explains Lizzie's panic when Laura looks at the goblins anyway and tells her sister in detail what she sees, prompting Lizzie to say 'No, no, no....their evil gifts would harm us', stick her fingers in her ears, and run away. The fruit itself seems to be classically taboo fairy food, utterly tempting and dangerous to eat; to eat the food of Fairy as a mortal is to be trapped in that world and lost to the mortal realm. It is a widespread belief in fairy stories, especially Irish ones, that a person should never eat the food or drink anything of Fairy, or you will be trapped there, and often a person who is tempted will be warned by another human among the Fey folk not to take what is offered (Ballard, 2001). The danger of the fruit is demonstrated by the story within the poem of Jeanie who ate the fruit and pined away. If the food does act as other fairy food on the mortal, one may assume that, like some uses of elfshot, Jeanie may not have died in truth but rather was taken as a changeling with the fruit binding her to Fairyland. Briggs however suggests that the fruit is a deadly part of a trap designed to murder the unwary (Briggs, 1976). In either case those who eat it are doomed in the sense that they are lost to mortal earth, although it does raise the interesting question of the connection between the dead and the Fey, which has always been ambiguous. The fruit may also reflect the idea of fairy glamour, where something is given the illusion of something else, in this case whatever its true nature the goblin fruit appears to be incomparably perfect and delicious, so wonderful that after tasting it no mortal food is good enough and the person refuses to eat. It is also worth noting that Laura does not pay for the goblin fruit with money, but with parts of herself, with her hair and with her tear, the two substances echoing the nature of the two materials - earth and water - that she stood between when she first heard the goblins speaking. Lizzie, however, goes to the goblins with silver to buy their fruit to take home and ultimately returns with her coin in her pocket. The final theme mentioned by Briggs is the rescue from Fairyland and this may be the least obvious although it is certainly present in the poem. Although Laura has not fully been taken into Fairy she is clearly under its enchantment from eating the goblin fruit and is close to death. Usually in examples of rescue from Fairyland a person must either have a way to force the Fey to release their captive or, as in the story of Tam Lin, must endure trials to earn the captive back. In this case it is through trials that the presumptive captive is freed, as well as a somewhat impossible quest being achieved. Normally once a person tastes the goblin fruit they are no longer able to hear the goblins, and thus can never find them to get a second taste; the first taste alone then dooms them. In this case the only way that Laura can be saved is for her sister to follow in her footsteps, to go as she did to find the Goblin Market but instead of buying the fruit with pieces of herself in trade Lizzie pays with silver. She resists giving in to temptation and eating the fruit, instead insisting that she must have some to bring away with her. She endures the assault of the goblins without complaint, without running away, and without fighting back, only focusing on not allowing any of the fruit into her mouth. She retrieves her money and returns from the liminal space, like her sister no longer knowing if it was day or night. Having endured the trial she is able to administer the cure to her sister, a second taste of the goblin fruit which is now bitter instead of sweet but ultimately frees Laura from the fairies' influence. The Goblin Market is a complex story and often overlooked in fairylore, yet it deserves a place alongside other older traditional tales. The market itself with its liminal location and constant movement, and its summer fruit at all times of year, as well as the deeper themes of buying death - or perhaps freedom from it - from the goblins with pieces of mortality (literally pieces of the person themselves) fit in well with other traditional tales. The goblins themselves are much like classical depictions of bogeys or the darker sort of deformed goblins found in some folklore. The poem can stand as a cautionary tale of dealing foolishly with the dangerous fairies, or of what happens when one gives in to obvious temptations and ignores the hidden costs. The Goblin Market, ultimately is a place where you can only buy the illusion of what you want and only sell what you should not part with. mó secht traigid, mó secht cét. cóel fo tuighib d'itib én. coire cert ocht fichet torc. more than seven feet, more than 700.
wattling under thatching of bird's wings. In both Irish and Scottish fairylore 'elfshot' or 'elf arrows' are a type of small weapon used by the Good Folk, and in Scotland also by witches, against people and livestock. The ubiquitous weapons of the Fey, elfshot caused a variety of maladies to those struck by them.The arrows themselves when found on the ground are small, neolithic flint arrowheads but when used by the Gentry are invisible to mortal eyes as are the wounds they cause. Finding such a small piece of flint or primitive arrowhead lying on the ground might lead a person to believe they had found a fairy-dart (O hOgain, 1995) and indeed such arrows are occasionally found and thought to be significant and powerful, for good or ill. In Scotland they were called 'saighead sith' [fairy arrows] and finding one on the ground was believed to bring a person good luck(McNeill, 1956). Indeed although being struck by one could be calamitous finding one was auspicious and it would be kept afterwards as a talisman. While some believed a found elf arrow should be thrown in water or buried lest it draw Otherworldly attentions, to others it was a powerful talisman, although it had to be kept covered from sunlight and not allowed to touch the ground again (Black, 1894; Wilde, 1888; Evans, 1957). It was believed in Scotland that elf arrows could not be found if a person was searching for one, but were only found by accident and usually in an odd or unexpected way (Black, 1894). This might include appearing in one's possessions or clothing after a walk outdoors or even in one's shoe. Lady Wilde however mentions the Irish belief that 'fairy stones' were often found near sí [fairy hills] lying on the ground, and ads no particular prohibition against intentionally looking for them. To posses an elf-arrow was good luck and they had magical uses as well, being used in cures for sick cattle as well as herbal charms (Wilde, 1888; Evans, 1957). There are several examples of found elfshot from Scotland that were set in silver and worn as pendants, because of the belief that they were protective talismans. When used as weapons by the Other Crowd elfshot was thought to be the direct cause of elf-stroke or fairy-stroke. This fairy-stroke could take the form of a sudden seizure or paralysis, cramping, pain, bruising, wasting sicknesses, and even death (Briggs, 1976). The most distinctive type of elfshot was a sudden, inexplicable shooting pain, usually internal (Hall, 2007). The fairies might use elfshot for anything from punishing someone for a minor offense, in which case the effect might be slight and temporary, to tormenting a person with great pain and suffering if they were truly angry. If they wanted to take a person they might use elfshot to paralyze them then switch the person with a changeling or a glamoured item like a log (Briggs, 1976). If they wanted to take cattle a similar procedure was used, where the animal was shot and would waste away and die, thus going to the fairies (O hOgain, 1995). Cures for elfshot varied. For people there are a variety of charms, drinks, and salves to be found in the old Anglo-saxon Leechbooks. Usually a person would be diagnosed with an elf related ailment, often involving sudden internal pain or an illness that was traditionally attributed to elves, then a cure would be prepared and given in conjunction with a chanted or spoken charm or prayer (Hall, 2007; Jolly;1996). For horses as well the Leechbook offers possible cures which involve a combination of actions, including shedding the animal's blood, and spoken charms (Jolly, 1996). For cattle the animal may be rubbed with salt water and made to drink a portion, given water that has both salt and silver in it, or rubbed with a found elf arrow which is believed to have curative powers (Black, 1894). One approach in Ireland was to spill a bit of the cows blood in a ceremony dedicating the animal to saint Martin (Evans, 1957). Often a specialist, a fairy doctor or wise woman [bean feasa], would be called in first to verify that a person or animal had been elfshot and if necessary to effect the cure (Jenkins, 1991). In some cases the effect of the shot was deemed permanent and could not be cured at all or the cure applied would not be strong enough to be effective. In some cases, tragically especially in relation to suspected changelings, the cure itself would prove fatal. Elfshot by any of the many names it has gone by - elf arrows, fairy arrows, fairy darts, fairy stones, saighead sith - are fascinating items. Terribly dangerous if they strike a person or animal they are a fearsome weapon of the Good People. Their effects can be transitory or permanent and may be mitigated with magical charms and herbal cures, and ironically the same exact shot that causes the injury can be used to cure it when wielded by a well-intentioned human hand. As dangerous as elfshot can be if it strikes a person it is also a wonderful talisman to possess if you happen to find one - but only if you remember to keep it with proper care, away from sunlight and off the ground, lest the Good Folk come back to reclaim it.